This entry was posted on Sunday, November 25th, 2018 by Frances Ryan. Yesterday’s adventure day out was a trip to the Anatomical Museum at The University of Edinburgh. The museum was never really on my radar, but I learned through last weekend’s Bloodscape adventure that it would be open this weekend. So, it just seemed that visiting was “meant to be”. And to further the kismet-ness of the day, as I waited for my bus into town, I visited the museum’s Twitter feed and learned that there was a lecture about William Burke that was due to start shortly after my planned arrival time. When I arrived, I had a bit of time to explore the exhibits on the entry level. The exhibits here were limited to a few death and life masks, some marble busts, a handful of illustrations, and (most interesting to me) the skeletons of two Asian elephants. They were massive and quite interesting, and I enjoyed being able to get quite close to them to really see how the bones were wired together for the display. Super cool! After admiring the elephants for a bit, I made my way to the anatomy lecture theatre for Janet Philp’s talk about William Burke. The talk was based on the research presented in Philp’s book, Burke: Now and Then, which tells the story of the Burke and Hare’s killing spree from the viewpoint of Burke’s skeleton. The book also shares the research that was used to underpin the story. I wasn’t really sure what to expect from the talk, but I was pleased to have come away with some great new insights into the Burke and Hare murders. Some of the things I knew: The movie gets it wrong; there was no grave-robbing involved; all but one of the bodies sold were murder victims. But I also learned a lot of new stuff, like the “gifting” of just one body per year from the Edinburgh Council to the Royal College of Surgeons, starting in 1505. (It was the need for more bodies that prompted the illicit body trade.) I also learned more details about the legal trials related to Burke and Hare, which was especially intriguing. I think I will have to treat myself to a copy of the book so that I can read up even more. It’s a bit of a morbid subject, but it is very fascinating, too! After the talk, I made my way to the main museum—the primary reason for the day’s outing. The museum was quite an interesting place, but it wasn’t really what I was expecting. More than anything, it felt like a well-presented storage facility rather than a museum. I think that was because of a lack of contextual information about the specimens on display. Don’t get me wrong, it was really interesting! 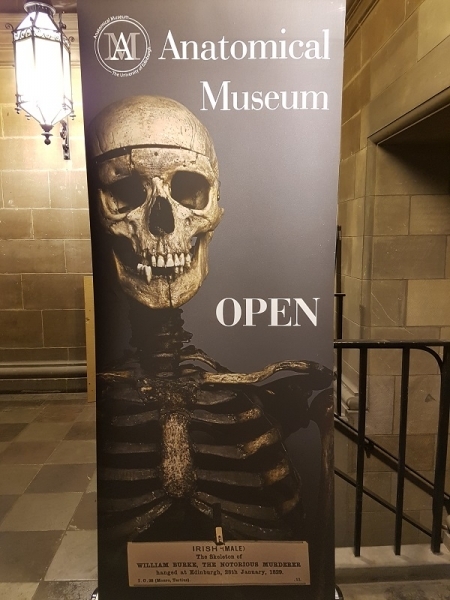 I think I was just hoping to have more details related to how the specimens came to live in the museum, and maybe a bit of context about how they were used in the study of anatomy in the past as well as in the present day. It was certainly a fun day out though, and a quirky little place that I will enjoy taking visitors in the future. I can already imagine the joy that one of my nieces would find from the place! Anyhow, now that I am fully recovered from my November deathbed, I am looking forward to many more adventures. I am also looking forward to catching up on some of my chores and craft projects at home. I am hoping that I can pack in quite a lot of adventuring and crafting in between now and the end of the year!